If you want to cook deliciously smokey meats but don’t want to spend hours watching over a traditional fire, then you’re probably in the market for a pellet smoker. Much like electric smokers, pellet smokers handle temperature control for you. Just “set it and forget it” as they say. Unlike electric smokers, pellet smokers can also reach impressively high temperatures (up to 500°), which means they are also suitable for grilling. A ton of new pellet smokers have hit the market recently, so choosing one can be a bit overwhelming. Hopefully with the help of our guide you can easily choose the best pellet smoker for your yard. How Exactly Do Pellet Smokers Work? What Should You Consider Before Purchasing a Pellet Smoker? The Camp Chef SmokePro DLX PG24 is our top choice. It has amazing temperature control, and the ash cleanout system means you won’t have to break out the vacuum to clean it. Additionally, it reaches higher temperatures than a lot of pellet grills on the market. The Lil Tex Elite 22 is a simple smoker without a ton of added features, but it offers the reliability you expect from Traeger. For impressive grill size and open flame searing, the Pit Boss 700FB Pellet Grill is an excellent choice. Want to take your pellet grill anywhere? The Green Mountain Grills Davy Crockett is the model for you. Spacious and durable, the Z Grills Wood Pellet Grill & Smoker has a larger than average hopper in addition to a storage cabinet. To jump straight to the in-depth reviews of each pellet grill, click here. You obviously know pellet smokers produce heat by burning wood pellets, but how exactly does the process work? Well, first you need to plug your smoker into an electric outlet and ensure that the hopper is full of pellets. When you turn the smoker on, you’ll select the temperature you want to smoke or grill at using a knob or buttons. It will then take some time to heat up, usually 10-20 minutes. Behind the scenes, an auger is feeding pellets to a “fire pot” area based on information it’s getting from a temperature sensor. It will continue to maintain your desired temp for as long as needed, assuming it has enough pellets. During the cooking process, grease runs off to a hanging bucket on the right side. After you’re done, most pellet smokers have a “shutdown” mode that burns up the remaining pellets for about 10 minutes. Pellet smokers are extremely versatile due to their temperature ranges – use them for low temperature smoking and high-heat grilling. As mentioned above, the “set and forget” design means you don’t need to tend a fire like you would with an offset smoker or traditional charcoal grill. Typically the “fire” area is positioned in the center, creating a more evenly heated chamber than a smoker that pulls heat and smoke from one side. Pellets are available in any type of wood you could want, in addition to blends. Pellets burn more efficiently than chunks or chips, and there’s very little chance of over-smoking your food with thick, acrid smoke. Note that some models, such as our top choice from Camp Chef, make cleanup easier with an ash clean-out system or similar features. This means the ashes and unburned pellets fall into a metal cup below the smoker – then you just remove the cup and dump those when you’re done. With other models, you’ll have to use a shop vac every once in awhile to remove ash. There are some differences in available temperature ranges between smokers, especially when it comes to high temperatures. Some only advertise temperatures up to 400°, other say 450°, and some get as hot as 500°. If high-heat grilling is important to you, be sure to choose a capable model, and verify with user reviews that the smoker can actually reach those temperatures. Probe – One nice feature some pellet smokers have (but a lot don’t), is a temperature probe that plugs into the control area. This allows you to see the temperature of your meat with a push of a button. The inclusion of this feature on the Camp Chef pellet smoker is yet another reason it’s in our #1 spot. Storage/Shelves – The lid of the hopper acts as a shelf on pretty much all models. Beyond that some smokers have an additional shelf arm on the right side, which makes dealing with multiple pans/plates much easier. Some grills even come with cabinet storage space under the cooking chamber, but that’s quite rare. Hopper Size – Hoppers vary in size, typically in the 10-20 pound range. Pellets burn slow, so it’s not like you have to constantly keep your eye on a smaller hopper. However, it can be nice to pour a 20-pound bag of pellets into your hopper all at once. Warming Rack – A second warming rack can add a lot to the overall cooking area. If you plan on smoking a ton of meat at once, it’s invaluable. Number one on our list, the SmokePro DLX PG24 from Camp Chef performs reliably in a wide temperature range and has a few extra features that set it apart from the competition. 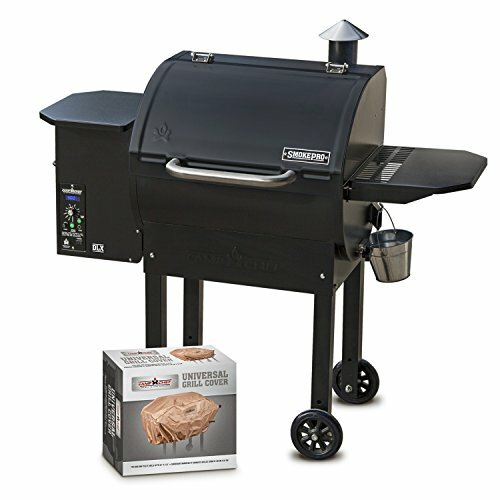 With a total of 570 square inches of smoking space, which includes a second upper rack, this smoker is more than equipped to handle your needs as a backyard unit. And it can get up to 500°, which is higher than most other pellet grills on the market. The patented ash clean-out system really sets this model apart from others. All spent ashes are easily collected with the pull of a lever and disposed of via a removable cup below the smoker. That means you won’t have to bust out the vacuum to clean your grill. This model also comes with a pellet purge function, which will empty out pellets in case you want to swap them for a different type of wood. The control panel, which includes a simple knob with 25 degree increments and an LCD readout, is super to use. If you want to use the included probe, just plug it into the panel and get its temperature reading with the push of a button. If you’ve got your eye on this model, check out our full Camp Chef SmokePro review here. More compact in size, with 418 square inches of cooking space and weighing less than 100 pounds, the Traeger Lil Tex still packs an impressive punch for a backyard smoker. 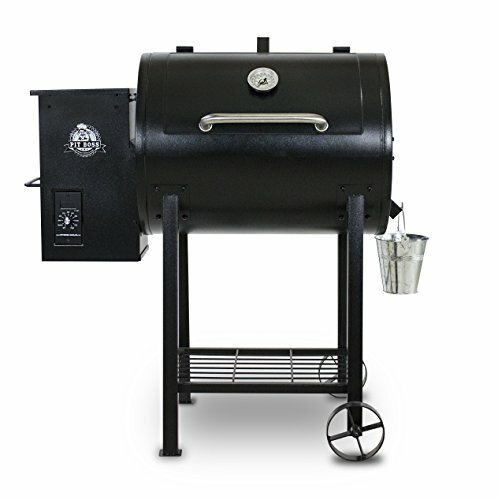 Two wheels aid with mobility, and with a heavy-duty steel construction and powder coat finish, this smoker is built for durability and to resist adverse weather conditions. The inclusion of the Digital Elite Controller allows for fairly precise temperature control, although the +/- 20 degrees Fahrenheit fluctuations may be a little too wide for the more dedicated barbecue enthusiast. Easy to get going, the auto-start ignition makes firing up the grill as simple as the flick of a switch. Once cooking is completed, the porcelain-coated grill makes clean up a breeze. The hopper does not have an ash dump, so vacuuming is necessary to clean out leftover ash and pellets. 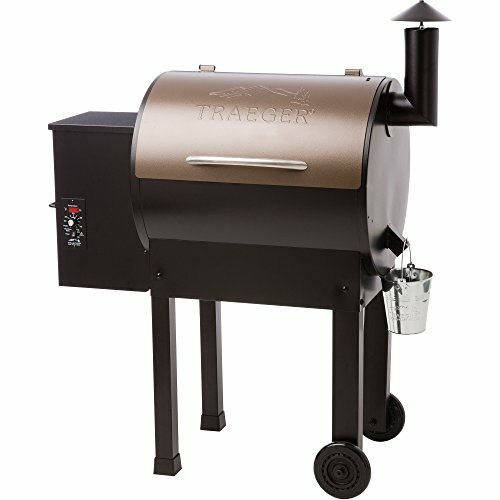 Boasting versatility, the Traeger prides itself on being able to grill, smoke, bake, roast, braise, and barbecue – whatever your cooking needs are, this grill is able to suit to fit. 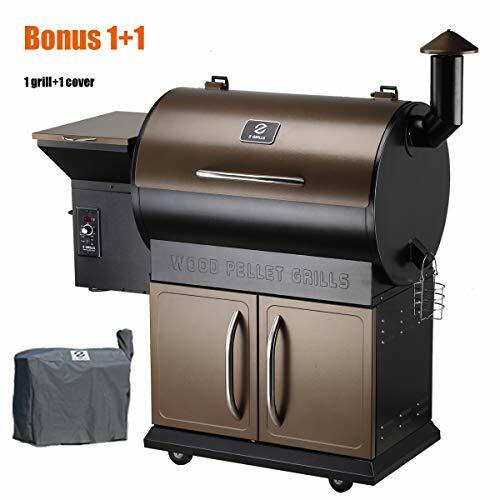 The large pellet hopper capacity, which holds, 18 pounds of pellets, gives this model a true ‘set it and forget it’ feel, ensuring that this smoker will keep cooking for as long as your meat takes to cook. Marketed as an “8-in-1” grill, the Pit Boss 700FB has versatility in cooking ability which allows for both direct and indirect grilling. The fan-forced air ensures even smoke and heat circulation inside the grill, and the ‘Flame Broiler’ enables a delicious sear while funneling away excess grease for easy cleanup. You have the option to set and forget this smoker or slide the broiler plate for open flame grilling. The Digital Control Center is accurate, with the internal temperature probe setting heat anywhere from low and slow smoking at 180°F all the way to quick grilling at 500°F. There is no meat thermometer, which is a relatively inexpensive addition, but this model does include a built-in temperature gauge attached to the lid, allowing you to further monitor internal heat. With an overall cooking space of 700 square inches, which includes a secondary grill for warming, smoking, and even baking, the Pit Boss 700FB has one of the biggest grill areas on our list. The 18-pound pellet hopper is fairly standard, providing more than enough fuel to smoke a large amount of food. The convenient storage rack situated beneath the grill is perfect for storing your cooking tools and your chosen pellets. If you are looking for a pellet grill to take on your travels, the Davy Crockett from Green Mountain Grills is ideal. Weighing under 70 pounds and able to run on 12V or 120AC, this portable model is perfect for camping, tailgating, or grilling anywhere you want to. The legs of this model are foldable, ensuring that it will fit in the trunk of any car. As a portable grill, the hopper size is significantly smaller, so overall smoking or grilling time is reduced, and the cooking space is limited too – just 219 square inches of grill. Regardless of size, this grill is able to cook up a storm. The digital temperature controller has a 150°F to 500°F range which can be set at 5°F increments for precision and this grill also comes with a meat thermometer so that you can accurately gauge internal temperatures too. 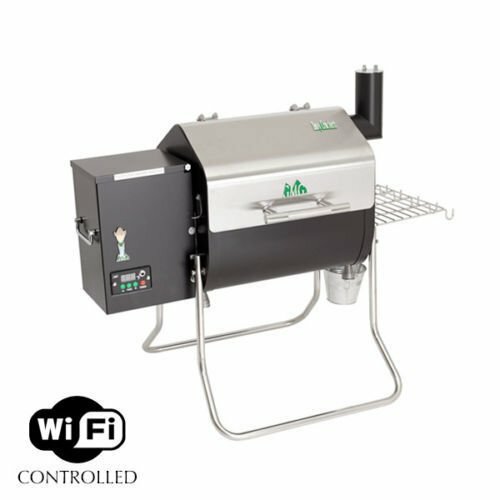 Truly a ‘set it and forget it’ smoker, the Davy Crockett is controllable through a Wi-Fi-enabled application, which runs on iOS or Android devices. From there, you can monitor and adjust grill temps without having to touch the smoker – just plug it in, turn it on, and keep an eye from your phone or other smart devices. Also included with this model is a convenient side tray with utensil hooks for holding your cooking tools, plates, or other necessities. With 700 square inches of cooking space spread over two grill areas and a hopper with a 20-pound pellet capacity, the Z Grills Master 700D is one of the biggest smokers on our list. On the lowest setting, this smoker can be set and left to cook for around 15 hours, which is great for large cuts of tougher meat. The Smart Digital Controller keeps the temperature within +/- 20°F of the set temp, maintaining a reasonably set continuous temperature. Four wheels allow for some maneuverability if you needed to put your grill into storage, but weighing in at a hefty 146 pounds, it may be difficult to move over uneven surfaces. Crafted from heavy duty stainless steel, the Master 700D is tough and durable and with the correct maintenance, is easily able to withstand fluctuating weather and constant use. Ash cleanout could be a little difficult as this model does not have an ash dump, but cleaning is simple with a vacuum. The hopper has a purge function, which will burn any leftover pellets, leaving minimal mess to clean up. While this smoker does have a grease spigot and bucket holder, you must provide your own container to catch the grease. A huge storage area is incorporated underneath the grill, with a cabinet space ideal for cooking utensils and pellets. Pellet smokers share a lot in common, and they all essentially function the same way. That means it’s the small details that really set them apart. The inclusion of a probe, ash clean-out system, and ability to grill at high temps makes the Camp Chef SmokePro DLX PG24 our top choice. Whatever it is that you’re looking for in a grill or smoker, I hope this article helped you choose the best pellet smoker for your home. And if you have any questions or comments, please let me know below!